Until recent seasons, the anorak was considered anything but cool. Then came along waterproof gear from aptly named Scandi brand Rains with its bags of swag. If ‘Trawlerman Yellow’ isn’t your thing, try throwing one of its new pastel creations, like this mint green offering, over a pair of raw denim jeans. After years of attempts to tame them, curls are officially being unleashed for 2019. The Chalamet effect, as we’re calling it, has led Label M to launch a range of hair products designed to enhance twirling locks including a styling Souffle which helps keep them conditioned while controlling any springy fly-aways. In one of the biggest team-ups of the year so far, Mr Porter has collaborated with uber-hyped fashion label Off-White on 44 pieces designed for the modern office. We don’t remember seeing an iPhone case scrawled with a list of all the label’s collections in the employee handbook, but who are we to argue with Virgil Abloh? Part fashion brand, part music label, Maison Kitsuné is one of the coolest names in or outside of Paris right now. We’re particularly taken with this scribbled logo tee, which would look ace worn under a navy overshirt or over striped shorts if you can wait until summer. Half-zip sweatshirts have been making some major waves in menswear lately. Aside from being easy to slip in and out of, they’re also extremely versatile – working in both layered smart-casual looks and streetwear get-ups. This one from high street store Burton is a good entry point, with sporty stripes helping it stand out, whatever it’s worn with. New Anglo-Italian brand Lorenz is streetwear 2.0: refined with tasteful and interesting prints that don’t require you to be a fire emoji-slinging, Instagram hypebeast to sport. This flecked burgundy beanie, for example, isn’t shy and retiring, but your mum won’t make you take it off when you return home for Sunday lunch. Not just good for bloke’s underwear, the Infinite Too timepiece from Calvin Klein is a masterclass is Swiss watches that won’t break the bank. 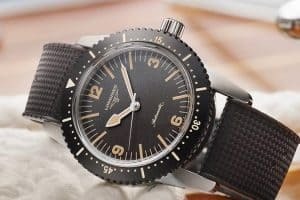 The precise automatic movement is more commonly found in expensive models by Geneva’s big players, making this a cheeky pick up for those looking for a quality watch under the £500 mark. A top-notch winter coat should see you through many a cold season, so don’t scrimp when buying one. That doesn’t mean having to skip a few meals to splash out, mind. This one from high street store Mango is cut from a warm wool-blend in a rich maroon shade that’ll have people thinking you spent a lot more than you actually did. The shacket, the Chelsea boot-wellie – menswear loves a hybrid. And now we’ve got these trousers from Pull & Bear, falling somewhere between cargo trousers and smart chinos (err, carnos?). Finished with a subtle grey check, team yours with a simple sweatshirt up top for some slick high-low styling. Since making it into the menswear big leagues, the rugby shirt has been taken into new uncharted territories. Take this polychromatic striped version from Pharell William’s fashion brand Billionaire Boys Club, which comes with a quarter-zip and a kangaroo pouch to stick your freezing mitts in. There’s more than a chance you’ve thought transitions lenses were a bit naff ever since you saw your grandad pick up a pair from the supermarket. However, trendy opticians Cubitts is set to make them hip (and less hip replacement) by sticking them inside sleek and modern frames like the black metal Cubitts Bingfield glasses with transitions lenses. Ever since Gucci misspelt its name on a truckload of logo tees, streetwear has started to itch its funny bone. Showing that the fashion tribe isn’t all po-faced poseurs, London-based menswear brand SCRT has created this clean black hoodie with an embroidered slogan proclaiming that it is, indeed, not hyped streetwear supremo Supreme. Although we could already tell that from the price point. Stockholm-based brand Eytys practically invented the chunky trainer trend when it was founded six years ago with just one silhouette, the ginormous ‘Mother’. Taking a starring turn in the latest big-name collaboration by H&M, the label pushes its sizeable statement further with soles bigger than a block of cheese alongside simple, branded gear. Act quick if you want to grab yourself one of these. Dutch brand Scotch & Soda turns out the kind of affordable wares that wouldn’t look out of place on the red carpet. 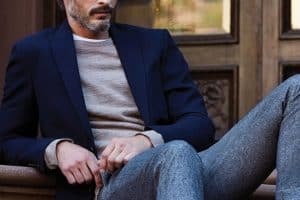 This 100 per cent cotton jumper is a good case in point – fun but classy, it would make you look like a real A-lister as an alternative to a dress shirt under a navy suit. The (end of) winter is coming. Okay, we might have a month or so left, but that means suede footwear will soon be back on the menu. When it is, these ankle-grazing Chelsea boots from Clarks will be first on our to-buy list. The dark grey makes the most of the tactile fabric and will play nicely with staple black jeans until spring arrives proper. In almost every other instance, it’s not a good idea to live in the past. The exception to this rule is retro running shoes. Reebok’s latest throwback is modelled on its classic Phase 1 runner from 1985, and looks pleasingly like the shoes every dad in the early nineties wore to play badminton in. One welcome update: a shock-absorbing midsole that cushions you against the tarmac. The most anticipated SS19 drop comes courtesy of Virgil Abloh’s first menswear collection at Louis Vuitton. With a distinct streetwear influence and strong references to The Wizard of Oz, the palette is definitely somewhere over the rainbow, but there are some very wearable pieces in there, from mint green hoodies to brown double-breasted coats. Our pick is this yellow brick road jumper, spotted on Michael B Jordan last year. Fair warning: this is Louis Vuitton. Nothing’s cheap. 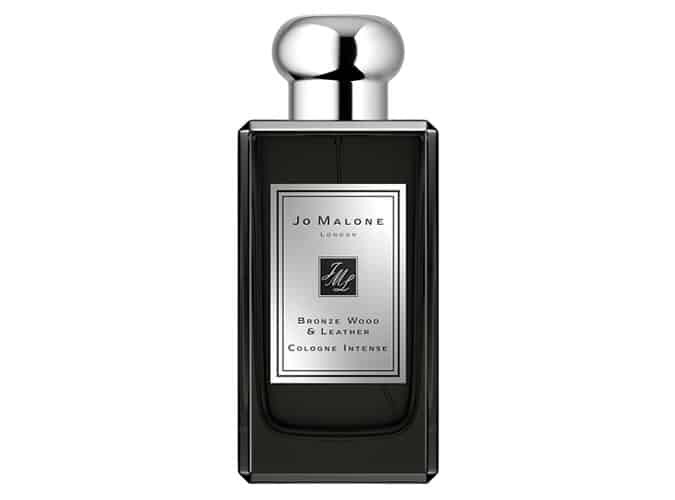 In case you didn’t already know, Jo Malone, the brand best-known for getting guys out of a tight spot on Mother’s Day, also has a range of fine smelling fragrances for us fellas. The latest features smoky leather, livened up by juniper and fresh grapefruit with notes of peppery vetiver to finish the spicy mix. Sound the unexpected collab of the week klaxon. Henry Poole, the brand that invented the dinner jacket, has shacked up with outerwear kings Canada Goose. There’s a quilted, down-filled blazer if that’s what’s been missing from your wardrobe, but we’re warming a lot faster to this amazingly soft scarf. Made from merino with a subtle herringbone pattern, we’d even wear it with black tie if the weather called for it. Denim. Yeah, it looks great, but it’s also the result of one of the most unsustainable practices in fashion. One brand whose eco-warrior credentials are water-tight, however, is Wrangler. It uses 99 per cent less of the stuff in its production than the norm to create jeans like these light wash cropped options. Do good, look good.